1-Bathroom Steam: It might seem too-easy-to-be-true, but this is a fabulous way to remove relatively minor wrinkles on dressy fabrics. It works especially well on garments made of satin, organza & tulle. Simply hang your gown on a clean hook or rod in the bathroom, turn on a hot shower, close the door & let it sit for 15-20 minutes. 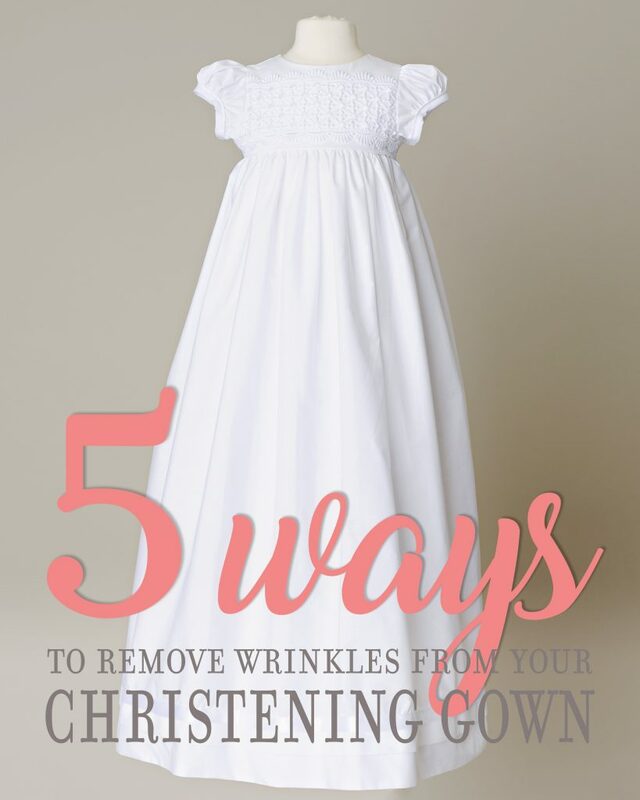 If mild wrinkles persist, you can rub them gently with a damp cloth, give them a little tug & allow the gown to steam for a few minutes more. 2-Dryer: Lightly spritz your tiny blessing outfit with water & toss it in a medium-heat dryer for a few minutes. Immediately remove your garment & give it a good shake when time’s up. Works well on cotton blends, satin, organza & tulle. Before you begin, make sure your iron is clean. You don’t want to ruin your outfit by heat-setting icky rust or other residues on your heirloom textile (Martha has an excellent iron-cleaning tutorial). It’s important to set your iron temperature to the fabric settings on the dial. Silk, satin, & organza can scorch or melt easily, so double check! Consider using a pressing cloth (such as a flour-cloth towel or piece of cotton fabric). It’s a great way to be 100% sure you won’t cause any damage to your christening gown or outfit. Simply lay the cloth over the garment, spritz with water, & press away. Always press smaller sections first and move on to larger areas. Example: press collars & sleeves before pants & skirts. 4-Steamer: If you have access, a personal or professional-grade steamer will remove wrinkles from silk, satin & organza. Add distilled water to the reservoir, turn it on & let the steam build up, check to be sure the wand isn’t spitting water (water spots = boo), then gently run the wand over and beneath the fabric. When running the wand beneath the fabric, be careful to avoid burning yourself…that steam is hot! 5-Dry Cleaner: If you have time and access, it’s not a bad idea to have your garment professionally pressed prior to your event. Be sure to ask your service provider if they are experienced in handling the delicate materials used in your christening outfit. And there you have it: everything you need to know to have your baby’s christening gown or christening outfit in tip-top shape for that once-in-a-lifetime day!